Justice League promotional still: WB. Lego Flash photo: Cheryl Eddy. Lego’s master builders are known for constructing some of the most gorgeous, complex statues of iconic characters you’ll ever see using nothing but thousands and thousands of little plastic bricks. This life-sized Lego Flash based on DC’s upcoming Justice League caught our eye, because something about it was... well, eye-catching. Of course, the lightning bolt chest emblems are different. 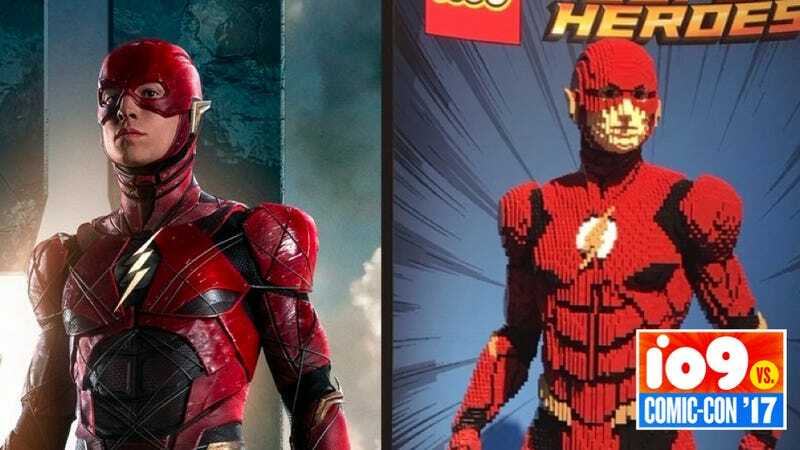 The abs portions of the suit are two different colors, while the overall red hues of the costumes seem to be different, too; the movie Flash suit is definitely less bright than the Legos, which isn’t a surprise. Hmm, what else? Coincidentally, at the time of publication, the temperature in San Diego is 74°.